When considering Golden Retriever adoption, falling in love with one is a very hard thing to resist if you’ve had the pleasure of meeting one. They have a gentle and stable nature, and are both loving and very eager to please their master. Not only do they make wonderful family pets and companions, they also make ideal service dogs. But does this mean that the breed is right choice of dog for you? Regardless of the breed of dog that we are attracted to, it is important to select a dog that will fit in with your lifestyle. Golden retrievers are well known to be devoted, loyal and mild mannered, yet they thrive on giving and receiving attention. They are also an energetic dog with an endearing playful streak. They undoubtedly love human companionship, and consequently, are not well suited to those that cannot commit much time to their pet. Daily exercise is an important part of their care and they need to be p rovided with both adequate room and time to play. They love to retrieve balls, sticks and even frisbees. In addition to providing them with plenty of opportunities to play, time spent socializing with other dogs is important. You can never go wrong by taking your golden for a nice long walk either. 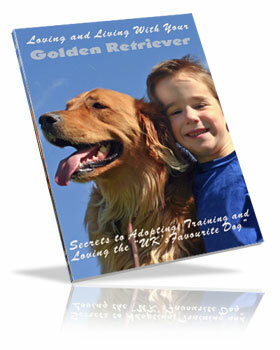 Human activities your golden retriever would enjoy sharing with you include swimming, hiking, jogging or biking. Owners sometimes forget that mental exercise is also an important aspect to their wellbeing. You will have little problem coming up with fun games or interesting things to do that will keep your dog entertained and prevent them from becoming bored. Goldens are eager to gain your approval so will participate willingly in anything you do. Golden Retriever Adoption becomes very easy because falling in love with a golden retriever is the easiest thing in the world! Goldens get along with just about anybody including children, strangers, and other pets. 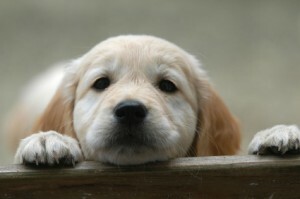 Their love for just about everybody means that golden retrievers make poor watchdogs. These dogs are fast learners and highly intelligent, which makes them easy to train, and therefore the perfect breed for an inexperienced owner. Golden retriever adoption will require positive obedience training with lots of praise together with the resultant treats. Be careful however as, these dogs love to eat! Many golden retrievers suffer from obesity problems given their love for food. Be sure to watch how much you feed him and weigh him regularly. Whilst young they are not as prone to weight issues, it can be a concern for older dogs as they become less active. One thing to note when considering golden retriever adoption is that whilst it seems like these dogs are the perfect family pet and companion, be warned that they do have a tendency to chew, particularly as puppies. Providing them with appropriate toys should ensure that your own belongings and furnishings don’t suffer this misfortune. Owners new to the breed should also be aware that the golden retriever sheds a lot of hair, particularly in warm weather. Regular grooming which includes brushing their coats, should be done about twice a week, perhaps more often when they are shedding more heavily. Matted and straggly hairs should be trimmed or cut out. Be sure to do the same to the hair beneath their tail for the obvious hygienic reasons. Because they have floppy ears, they should also have their ears cleaned regularly to reduce the risk of infection. Given that the golden retriever is such a heavy shedder, it may not be a suitable breed for those with allergies. Now you know why Golden Retriever adoption is an easy choice!